Ahoy Matey’s! Did you know that today is National Talk Like a Pirate Day?! 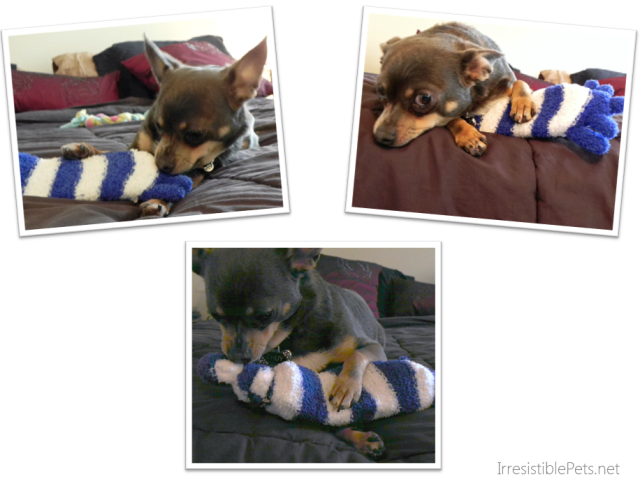 That’s why I made Chuy this striped pirate sock toy because pirates love stripes! 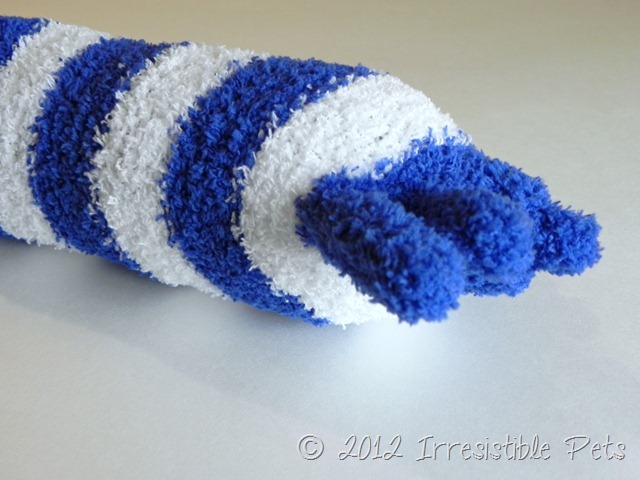 We want to share how to make this with you. Ready? Let’s seaaaaaa how to do it! Be sure to also check out our DIY Pirate Costume! A fun toy that your dog can play fetch with, tug a war, and helps reduce overall boredom! It costs me $1 so you won’t need a lot of pirate booty! How? I picked these “toe socks” up from the Dollar Tree for $1 and recycled an old water bottle. 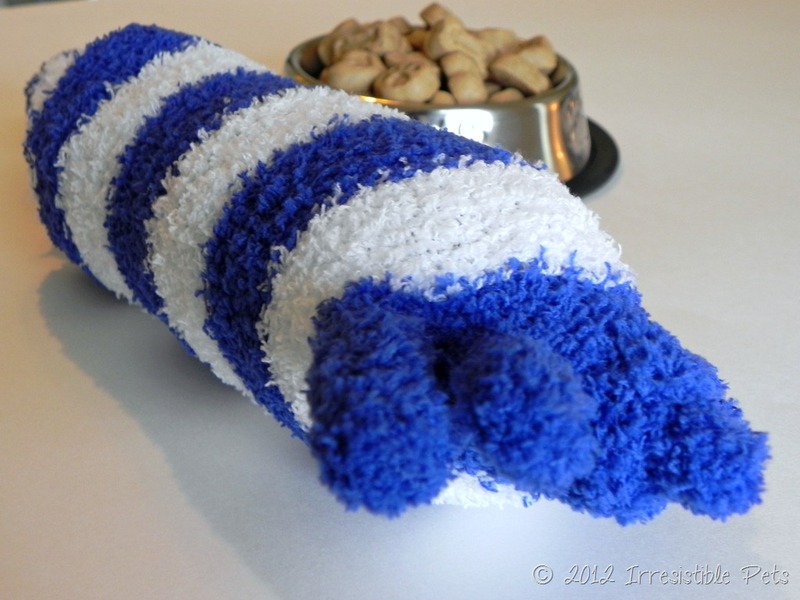 Learn how to make this Pirate Sock Toy for your dog as pictured below. If you want to learn more, keep reading! Arrr! 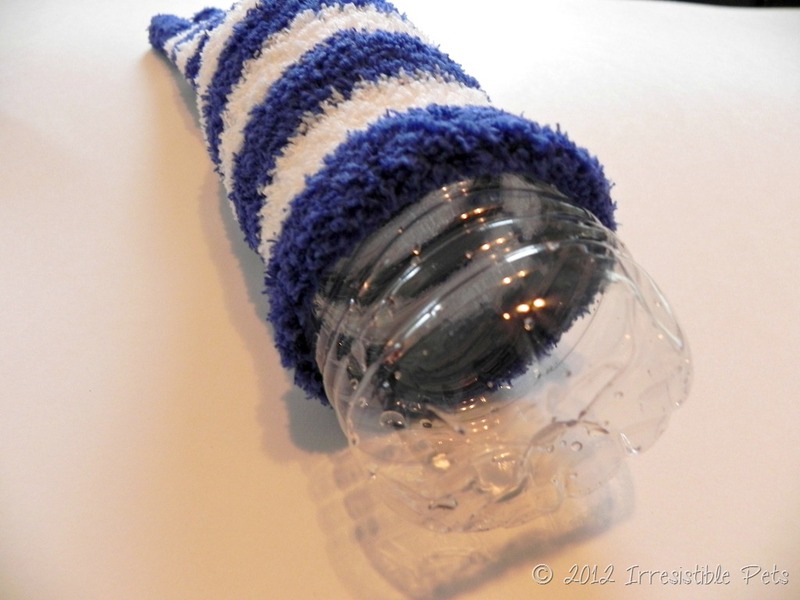 Take an old water bottle and remove the cap, ring, and label. 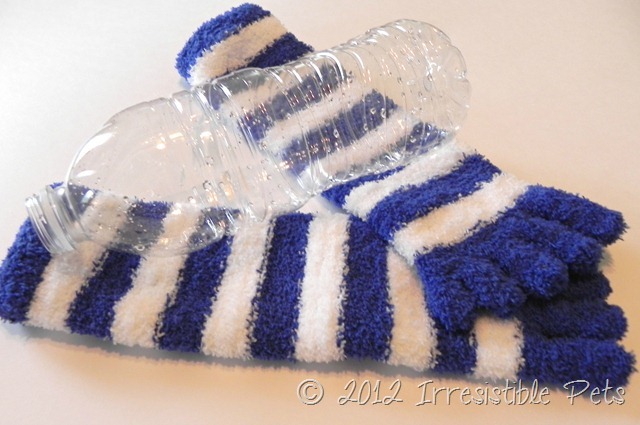 Insert the water bottle inside of the sock. Tie a knot at the open end of the sock. That’s it! 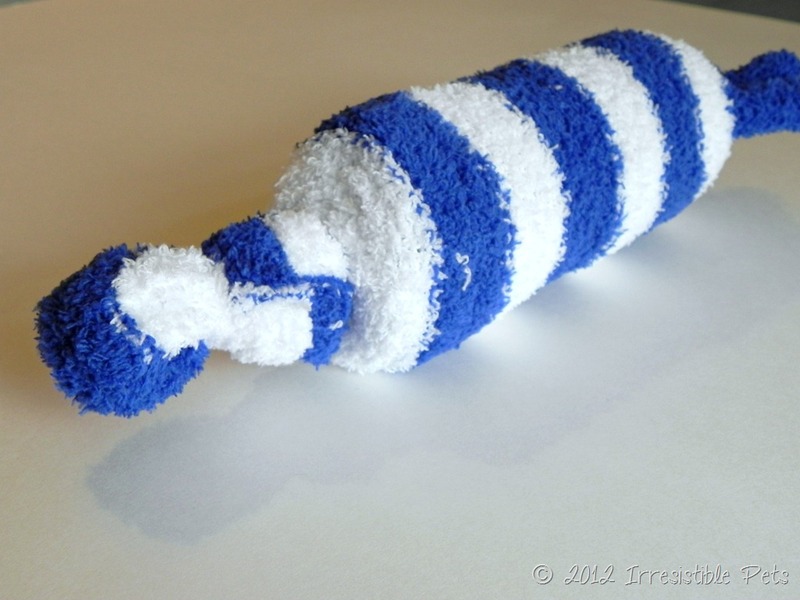 My Pirate Sock Toy turned out like this. 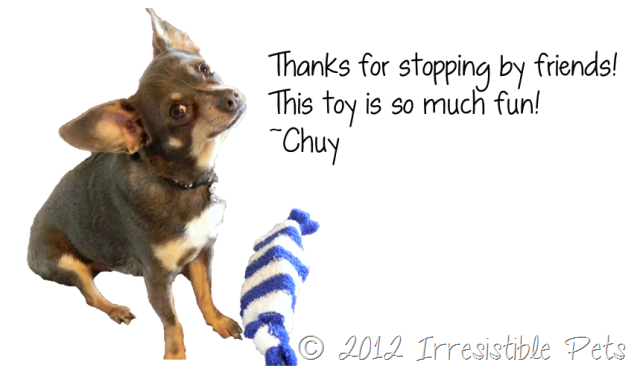 And yes, Chuy LOVED it. He was whimpering the whole time I was making it because he couldn’t wait to play! Check out our DIY page to see more “Irresistible” DIY pet projects that will help you save money. that pirate sock is sooo cute!! Thanks for visiting us today! Thank you! Nice “meeting” you! Happy WW! Awesome, thanks! We appreciate the love! Hey! Thanks for stopping by LeftOvers4Dinner! This is such a cute idea! I tried something similar for my bigger dog, Bender, but he destroyed it in no time. 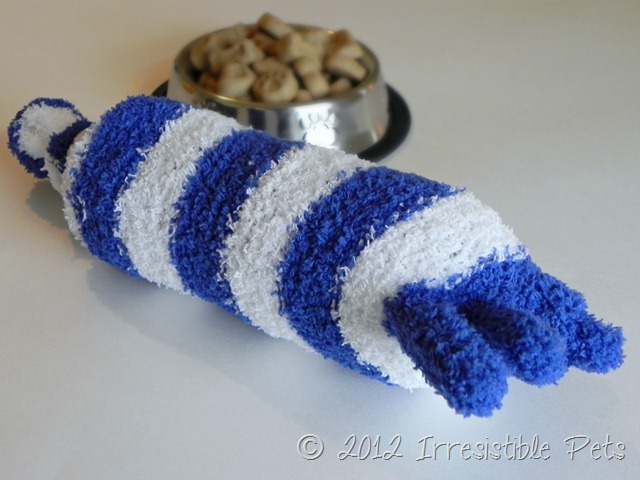 Since I’ve got Pepper now (and she’s an adorably tiny Chiweenie), I’m sure she’ll love it! Thank you! You definitely should try it out!! 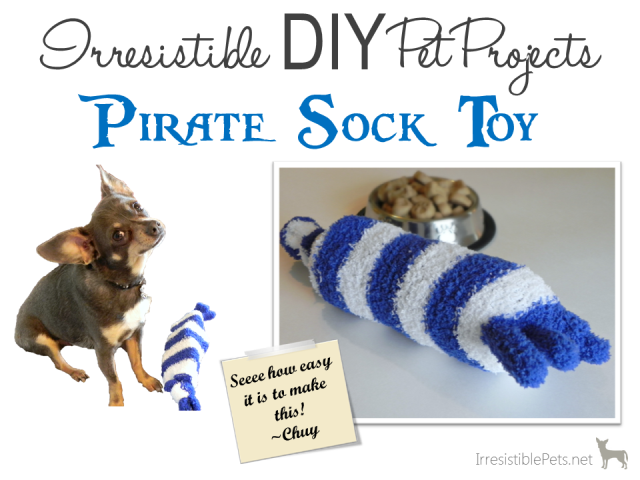 Love the DIY pirate sock toy! 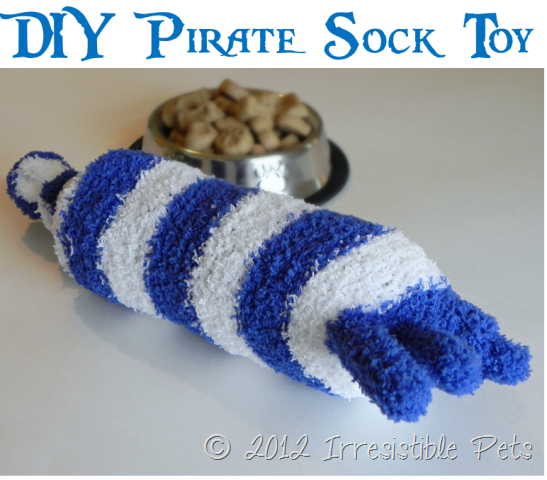 I’ll have to run over to the dollar tree and get me some pirate socks and make the boys a few sock toys.